In 2015, the City of Dallas (COD) premiered its Lean Six Sigma (LSS) program. Within a year of this strategic, LSS began to show evidence of how instrumental it is in the disciplined application of proven management systems and providing services to citizens more efficiently and effectively. Lean Six Sigma is an integral part of the new Office of Innovation (OOI), which is responsible for leading the innovation process within the City of Dallas and providing the necessary ecosystem that allows ideas to germinate, take root and flourish. LSS works closely with the City Manager's Office as a management consultant to City departments to develop and inspire the development and implementation of data-driven best practices in municipal government and foster a culture of innovation, efficiency, and process improvement. To ensure a successful program, LSS conducted an internal research of policies enacted by city council, department goals and challenges, and employee interests in creating a better work environment. With that knowledge, the LSS strategic plan materialized by identifying opportunities for improvement, motivating government employees, and building knowledge and empowering employees to create change in work processes. With the full support/buy-in from the City Manager’s Office, recruiting employees for the trainings was not as challenging. Since the launch in Fall Quarter 2015, the City of Dallas trained 10% of it’s workforce of 13,000 in continuous improvement, Lean Six Sigma, and Project Management. To date, 60 projects have been completed and 40 are in progress. The primary focus of these projects is to provide service-level efficiency improvements to city operations. 5. Streamline Parks &Recreation Warehouse Operations (5S). 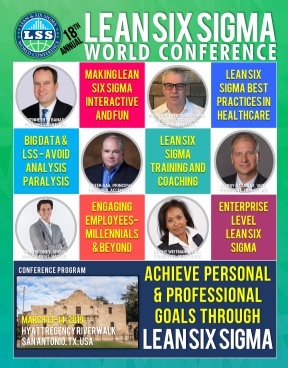 The presentation demonstrates how a large U.S. city successfully implemented and has sustained its Lean Six Sigma program while it cultivates innovation through continuous improvement systems and practices, to achieve “service first excellence” by empowered employees and progressive leadership working together.